Wu Hao 2P of China is still undefeated after six rounds and will face Albert Yen 7d – who defeated Gansheng Shi 1P in round six – in round seven of nine Friday morning. American professionals Andy Liu 1P and Ryan Li 1P both have five wins. 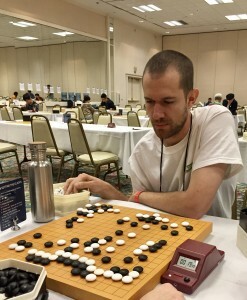 Roughly 350 players in the main US Open field played Sunday, Monday, Tuesday, and Thursday mornings, and 26 of them remain undefeated with four wins. Those players are Isabella Leong 22k, Zizhao He 10k, Justin Lee 10k, Mario Espinoza 9k, Darwin Kim 8k, Elias Klingbeil 8k, Arenas Rudvalis 6k, Kevin Steadman 6k, Shawn Blue 4k, Noah Doss 3k, Gregory Pongracz 2k, Terry Benson 1k, Anthony Long 1k, Nathanael Eagle 1k, Reinhardt Messerschmidt 1d, Ken Koester 2d, Benjamin Armitage 2d, Daniel Alvira 2d, Lee Huynh 2d, Gilbert Feng 3d, Ziqin He 3d, Jianuo Wang 3d, Tyler Oyakawa 3d, Mizuo Sakakibara 5d, Yang Hong 6d, and Ruochen Sun 7d. -photo (right): Seniors’ Tournament director Greg Kulevich considers a move.